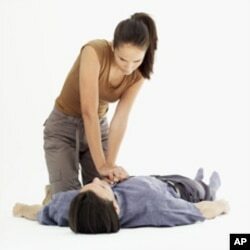 Cardiopulmonary resuscitation, or CPR, has been around in its modern form for about 50 years. Its rhythms of chest compressions and mouth-to-mouth breathing have saved countless lives. Now, a new study adds important evidence to the emerging consensus that, in CPR, the chest compressions are the real life-savers. In this new study, callers to emergency services reporting a suspected heart attack were randomly told either to do full CPR, with chest compression and blowing air into the patient's mouth — rescue breathing — or do just chest compression. These weren't medical professionals, just ordinary, untrained people. Emergency service dispatchers talked them through the procedure over the phone. Remarkably, as measured by survival rates at discharge from hospital, it made no statistical difference whether the CPR included breathing. "What we observed was the group that got chest compression only in CPR had a survival [rate] of twelve and a half percent to hospital discharge," says Thomas Rea of the University of Washington, led the study. "The group that got chest compression plus rescue breathing had a survival of 11 percent. Chest compression is at least as beneficial as chest compression plus ventilation." Evidence suggests the chest compression alone is as beneficial as chest compression plus mouth-to-mouth. The results seem counter-intuitive. The chest compressions are designed to circulate blood, which carries oxygen, and the breathing supplies the oxygen. But Rea says that, even if the heart has stopped, the red blood cells are still holding a supply of oxygen. "And so, taking the time to interrupt the chest compressions to provide the ventilation is not as important early on because of this reservoir, ready reservoir of oxygen." Many people who might otherwise give CPR are reluctant to put their mouth on a stranger's mouth. And so Rea says his study highlights one way to increase the odds of survival for heart attack victims by encouraging CPR. "And we need to make it simple for people to do that, the lay public. And so the core emphasis needs to be on chest compression. 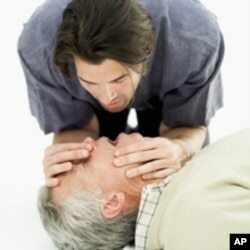 Every victim of cardiac arrest should receive chest compression. Chest compressions can save a life. You will not hurt the patient. You can not do it wrong. You can only help. And you can only save a life." The CPR study by Thomas Rae and his colleagues is published in the New England Journal of Medicine.